Quincy the Boat Dog is a Great Dane. She often smells like a wet dog and tends to sleep, eat and wag her tail quite a bit. 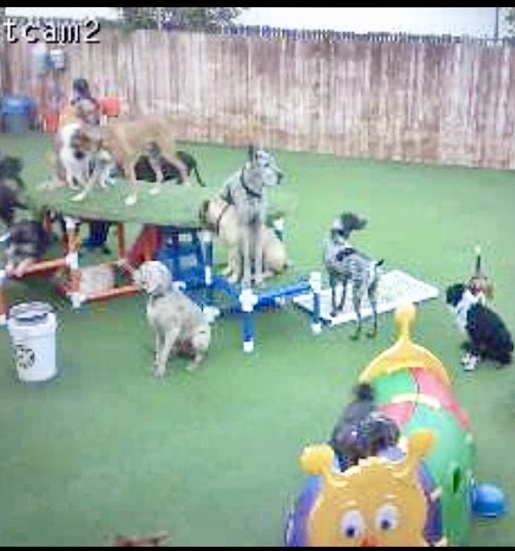 Sometimes during the day when I have boat work or have to run around doing errands, Quincy goes to doggy day care and LOVES it. But I never thought I’d see her do this……. Sometimes you gotta sit on top of them. Not my fault I’ve got tall legs! Quincy the Great Dane lives on our Aleutian 51 Sailboat with us as we prep to leave on the 2019 Baja Ha-Ha in November. Really? I hadn’t thought about that part of it, but perhaps you’re right? Maybe that’s why she doesn’t mind the doggy day care and he looks hefty enough to keep up with her. thanks for the comments, I love the interaction and that fact you keep reading this tiny blog.